An important factor in makeup is not only the choice of makeup, but also lipstick and gloss application techniques. A lot depends on the way you put on lipstick. Some say that it is quite easy to use lipstick - you just make a few strokes of lipstick. But this is not so. In fact, lip makeup is the most complicated, it requires precision, accuracy, and professionalism. But there’s no need to fret because every woman is quite capable of mastering it. 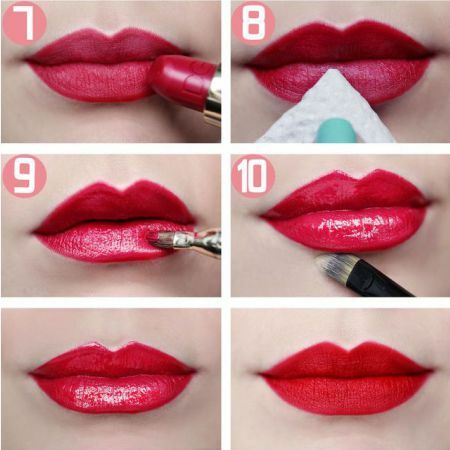 Here we'll discuss different techniques for applying lipstick and gloss. The classic option is to cleanse your lips, use a balm to moisturize them, draw a contour line with a lip pencil, and apply a lipstick. Another option is one with a special base. We should note that lip balms are primarily intended for lips that are prone to dryness and labial fissures. Use a lip balm soberly; otherwise, you run the risk of your lipstick "flowing." In order to avoid this, use a foundation that prevents makeup from flowing and gives it resilience. Another technique is to use powder. 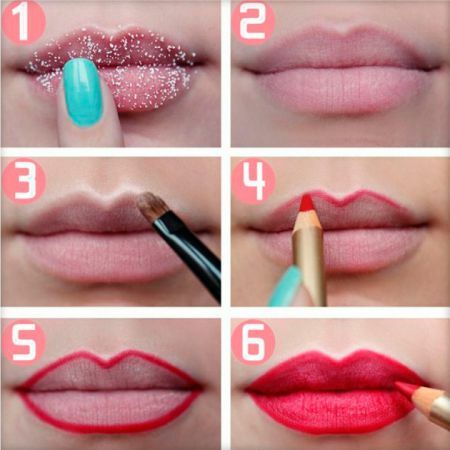 Before you use a lip pencil or lipstick, apply a little powder on the lips. Just like with foundation, using a little powder will make your makeup more durable. Lastly, you can try multilayer coating. After applying lipstick, blot the excess with a napkin, then apply some more powder, and then apply another coat of lipstick. You can even apply some gloss over the lipstick. The main thing is to choose the right color combination. So transparent gloss with a hint of red would be the best for a red lipstick. Choose a translucent gloss of beige shades for a pink lipstick. Pink gloss for a brown lipstick will result in a nice dark coral color. The multilayer coating method is especially good for evening makeup or makeup for other special occasions, such as a wedding. It is up to you whether you want to use a cotton puff. Many professionals like cotton puffs, and for us the result is important, so it's better to accommodate to your own convenience. Some women are used to applying lipstick with their finger, though it is hardly a good or correct way. Liquid lipstick and gloss have a convenient brush, so there are no problems at all. There is no need to say that the modern beauty industry has leaped forward, our mothers and grandmothers could not even dream about this. We are able to enjoy a wide range of makeup products on the market and the level of their quality is better than ever. Experiment with new products, and you can achieve amazing results. Like the article «Lipstick and Lip Gloss Application Techniques»? Share it with friends!